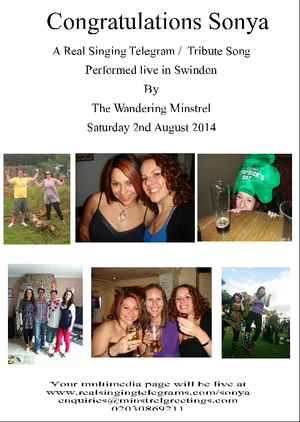 On Saturday 2nd August 2014, The Wandering Minstrel travelled to Swindon to surprise Sonya on her hen night. Her friends told the minstrel lots of things about her and they all went into the song. 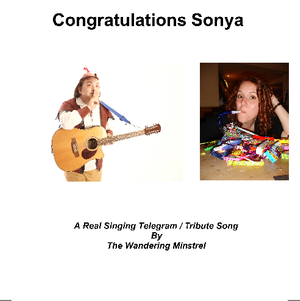 On this page you will find, the artwork for the photo laminated lyric sheet, and the CD artwork, together with the audio for Sonya's CD and the lyrics too. If you have photos and videos from this special surprise, that you would like to appear here, you may post the link into the comments box or send us an email if you need some help. 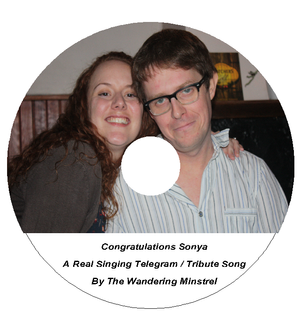 We also hope that you will use the share buttons on this page to share this with Sonya's family and friends who coul not be there on the night. My thanks to Sian and all the other hens for making this happen. My thanks to Sian and the the other hens for sending me this short video clip of her Real Singing Telegram. Notice the reactions on people's faces, this is the reason why I do this. This was an absolutely amazing Telegram and I just love performing it. 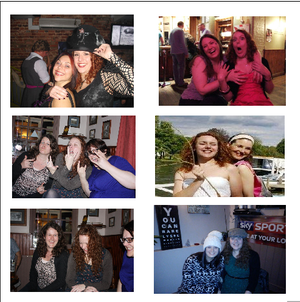 Thanks again to Sonya, sian and all the other hens for making this happen. 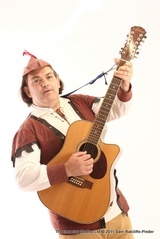 so they’ve sent this minstrel to sing to you. And you’ve sucked wine from Rachael’s rug, you’d spilt it on the floor we know. he had the whole wedding booked within a month I hear. But your massive rabbit buttercup, can’t be here tonight it’s true. All copyright for finished songs belongs to minstrel greetings, although your order includes the license to share the song, or performance video on the internet, as long as you link back to us, or use the multimedia page provided. Multimedia pages can be password protected if you only wish to share it with your own family and friends. DVD singing grams are live recordings of personalized songs created on DVD video, alongside a full band production audio CD which can be sent worldwide. For Live performances within the UK, a deposit of £50 secures your booking and also covers the writing of the song and the production of the discs. In the event of cancellation by either party, after the song is written and the discs produced, the discs will be sent by post and no other monies will be due either way. Cancellation by the customer that occurs after travel will mean that the performance fee is also payable.